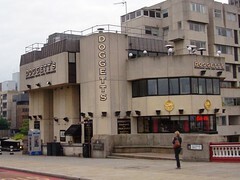 A decent enough pub from a not overly exciting selection along Bankside, which to give it its full name is "Doggett's Coat and Badge". This one overlooks Blackfriars Bridge. There's a large beer garden area out the back, and a fenced-off seating area along the river. Some of the windows along the front of the pub have river views though it's not particularly overwhelming in the downstairs area. Bars on the upper levels give progressively better views, as well as generally being emptier (on a sunny afternoon visit in August 2008, the downstairs bar was crowded with people, but the one a level up -- where there are pool tables -- was empty). The best place to be is in the Terrace Bar on the fourth floor, which has a balcony overlooking the Thames with excellent views. This and the floors below are all available for hire, so it may be that they aren't accessible on any given visit, but if you have the chance, it's well worth it. The ale on pump is London Pride, with a few other guest options. Food is served until 10:30pm (lunch from noon-5pm and dinner from 5pm-10:30pm). Last visited by Ewan, Jo and others, 30 August 2008. Food times taken from website, May 2008. Last edited 2016-09-18 15:33:42 (version 11; diff). List all versions. Page last edited 2016-09-18 15:33:42 (version 11).